In fact, a well-planned approach to Exchange database backup and recovery ensures service-efficiency and reduced downtime. 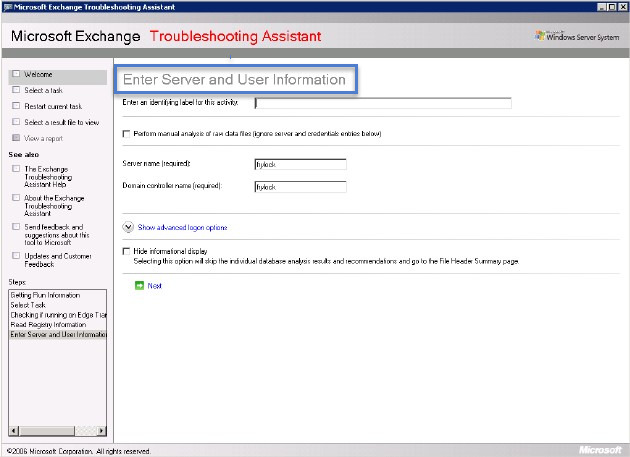 If the Exchange database is inaccessible, then there is an option to restore Exchange 2007 mailbox with the help of updated backup. An updated Exchange backup gets you ready, only when you have an understanding on how to use PowerShell commands to restore through successful mailbox recovery and merge recovered databases in Exchange 2007. If the job is not performed successfully even after several attempts and if the backup is corrupt or not updated, then the next best option is to try a reliable software in order to accomplish the objective, which helps to recover Exchange 2007 mailboxes. How to restore mailbox exchange 2007 with PowerShell? 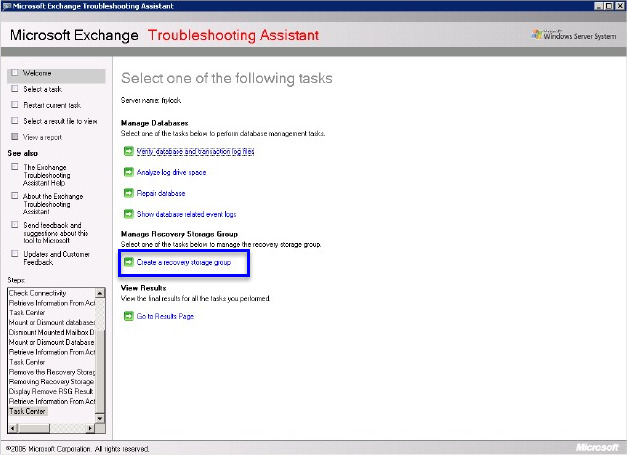 The process to recover an MS Exchange mailbox 2007 involves attaching the recovered EDB and LOG files to Recovery Storage Group (RSG) in Exchange followed by using Exchange-supported tools like Exmerge.exe for PST file extraction. Step 4: Once you have created Recovery Database, proceed with creating a new restore job. 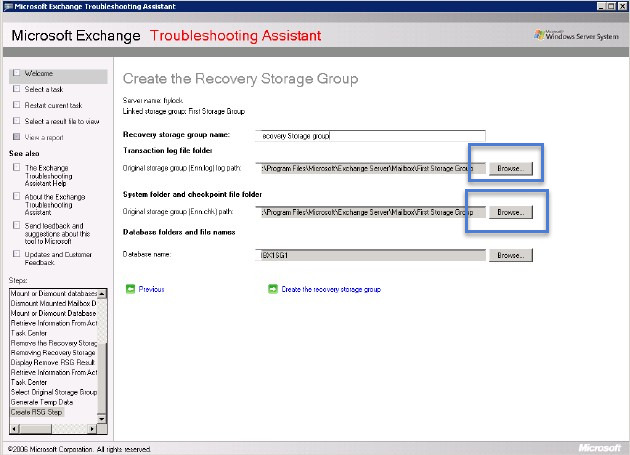 Step 8: Checkbox for Redirect to Recovery Storage Group (RSG) (Exchange 2007 only) and the next screen of Restore Job Properties displays. Click on Run Now button to initiate the Restore task. 1. 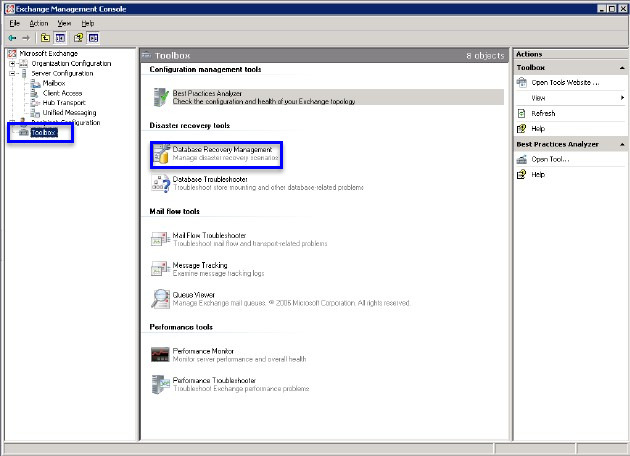 Go to EMC and locate the Toolbox option in the left pane and locate "Database Recovery Management" as available under "Disaster Recovery Tools"
Verify Exchange data, and if any of the emails are not accessible, then you have the option to merge it with production mailbox. 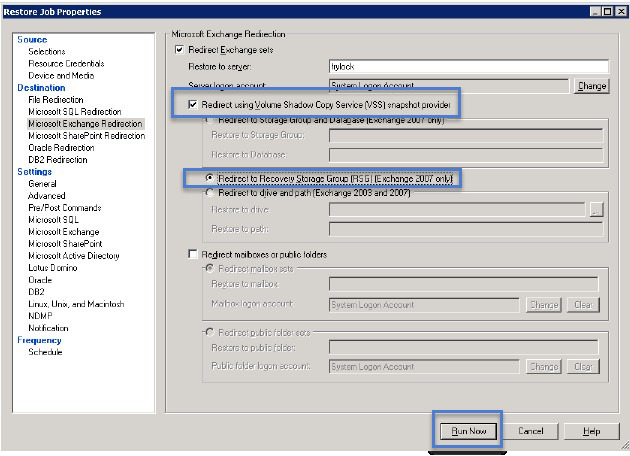 Use Restore-Mailbox cmdlet to copy the database of end users from RSG on a server having Exchange 2007 to another server. 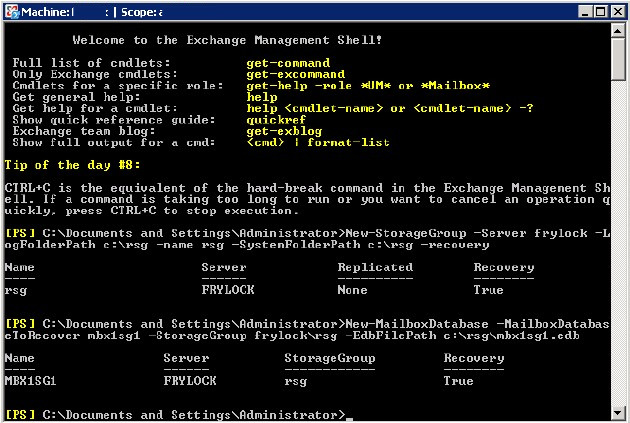 After the completion of this process, PowerShell commands can restore Exchange 2007 mailbox. RSGs are not used to restore Public Folder data. It is used to restore only mailbox data. 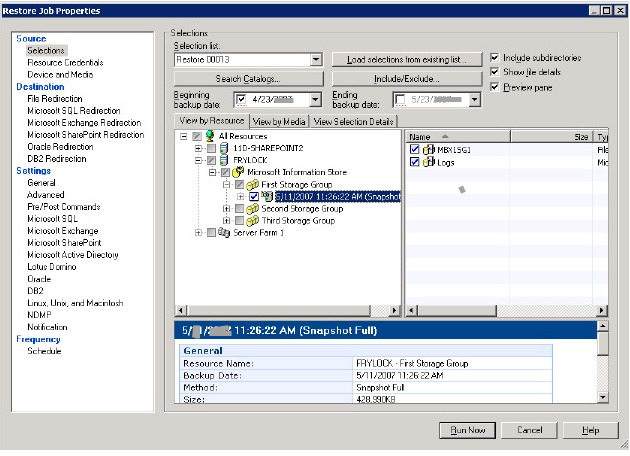 There is an option to create up to 50 Storage Groups on an Exchange 2007 Enterprise Edition server, but there is a limitation to create only one RSG on one server. Though you can add multiple mailbox databases to the RSG on a single server, all mailboxes should be from the same storage group. PowerShell commands are lengthy and challenging to execute. There is a simple solution to overcome the limitations of PowerShell commands and RSG to restore Exchange 2007 mailbox. Launch and open the software. From the Homepage, click on Open EDB to browse for required Exchange Database file and once you select the EDB file, click on Start button to initiate the process. You can also click on Find EDB instead of Open EDB if the file location is not known. Complex, lengthy and time-taking PowerShell commands can be replaced with easy, non-lengthy and lesser time-taking steps of Stellar Phoenix Mailbox Exchange Recovery Software. This software restores EDB files into multiple file formats and if required, also recovers and exports Exchange mailboxes directly to Exchange or Office 365. The best part is that the software also exports the recovered Public folders irrespective of the number of folders. Whether the mailboxes are on single storage group or multiple storage groups, this software successfully restores exchange 2007 mailboxes and saves them all into the preferred file format.